Valerie Constantino presents “Crossing Sublime (After After Nature),” an exhibit of recent works that kicks off Sacramento State’s art shows for the spring semester. The show runs Jan. 23 to Feb. 22 at the Robert Else Gallery with a reception from 6 to 8 p.m. Friday, Jan. 27, and an artist talk from 4 to 5 p.m. Tuesday, Feb. 7. Regular gallery hours are noon to 4:30 p.m.
A lecturer at Sacramento State and American River College, Constantino has created new works inspired by W.G. Sebald’s narrative poem After Nature. The pieces consider the fluid crossings of time, matter, and being, and include photo-montages, collages, mixed media on paper, sculptural elements, writing, and an audio component. Sebald’s publisher describes his work as a “haunting vision of the waxing and waning tides of birth and devastation that lie behind and before us.” For Constantino, Sebald’s ruminations of the interrelatedness of materiality and transcendence substantiated analogous themes in her work. I recently finished reading Dušan Šarotar’s book Panorama (Peter Owen World Series, 2016), which I plan to write about soon. It’s a book that was openly done in admiration of Sebald. Now, Šarotar has written the introduction to the first Slovenian translation of Sebald’s The Rings of Saturn, and his English-language publisher has posted a translation of Šarotar’s piece. Take a look. I let my coffee run cold and thought about detectives. Partners depend on one another’s eyes. The one says, tell me what you see. His partner must speak assuredly, not leaving anything out. But a writer has no partner. He has to step back and ask himself – tell me what you see. But since he is telling himself he doesn’t have to be perfectly clear, because something inside holds any given missing part – the unclear or partially articulated. 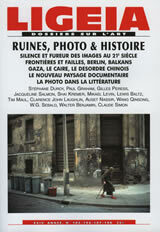 The newest issue of the French art magazine Ligeia: Dossiers sur L’Art has a major section devoted to the theme of Ruins, Photography & History, edited by art historian Zaha Redman. I was invited to submit something on Sebald, which allowed me to write a piece that was longer than my usual blog post. My essay The Silent Catastrophe: Sebald’s Manchester (that’s the English title) explores Sebald’s relationship with Manchester as reflected in After Nature and The Emigrants. None of the essays are online and I’m afraid I don’t know how easy it is to obtain an issue outside of France. The second triptych of essays in The Undiscover’d Country: W.G. Sebald and the Poetics of Travel uses the heading Textual Excursions, Expeditions, and Adventures to focus on some narrower aspects of Sebald’s writings. 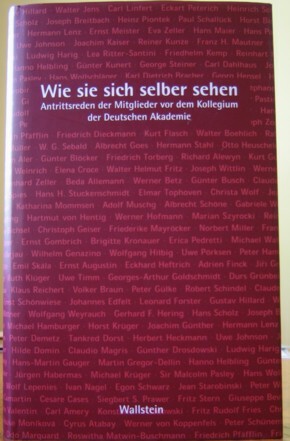 The best essay of this section, in spite of its title, is Alan Itkin’s “Eine Art Eingang zur Unterwelt”: Katabasis in Austerliz, which examines Austerlitz within the tradition of epic literature, notably Homer’s Odyssey, Virgil, Dante, and Milton, showing how Sebald structured Austerlitz as a venture in the underworld. Itkin makes the case that Austerlitz is Sebald’s most novel-like work of prose fiction and that with this book Sebald broke the pattern in which he had formerly used the trope of travel. In his first three books of prose fiction, Sebald’s model of travel writing was to “demonstrate that it is the uncanny position of the modern subject never to be sufficiently lost.” But with Austerlitz, he returned to something more closely approaching the classic model of travel writing in which the narrator loses his way, then finds it again. Itkin sees Sebald making the case that National Socialism was inextricably linked to “the senseless expansion of the bourgeois age” that preceded it. The dark side of progress is “an equally strong compulsion to destruction,” a theme that weaves in and out of all of Sebald’s books. The remaining two essays are exercises in diminishing returns. Each left me feeling that the needles I finally found in these haystacks were blunt and only marginally useful. Martin Klebes’ essay If You Come to a Spa: Displacing the Cure in Schwindel. Gefühle and Austerlitz, looks at two of Sebald’s travelers and their visits to spas. He looks at the Dr. K. Takes the Waters at Riva section of Vertigo and at Jacques Austerlitz’s trip to the spa at Marienbad. Each man undergoes a transformation at the spa that has nothing to do with the expected “medical regimen” function of a spa. Instead, “Sebald’s narrative strategy is to ‘renew’ his protagonists at the spas …through intertextual references that reveal the split within each of them not as a feature of their psychological constitution but rather as a division visible on the textual surface itself.” What does this mean? Well, in both of the situations that Klebes cites, Sebald creates uncertainty and tension surrounding the identity of the protagonist, both of whom echo characters in other works of art. In the Vertigo example, “Dr. K. both is and is not ‘Franz Kafka’.” While in the Austerlitz example, Sebald overlays references to characters from Alain Resnais’ film L’année dernière à Marienbad (Last Year at Marienbad). James Martin’s essay Campi deserti: Polar Landscapes and the Limits of Knowledge in Sebald and Ransmayr examines the middle section of Sebald’s long poem Nach der Nature (After Nature) and Ransmayr’s 1984 novel Die Schrecken des Eises und der Finsternis (The Terrors of Ice and Darkness), which I wrote about earlier. In this section of After Nature, Wilhelm Georg Stiller joins the Great Northern Expedition of 1741, led by Vitus Bering (of the Bering Sea and Strait). Martin sees Sebald making the point that these polar expeditions represent “the limits of the Enlightenment’s quest for knowledge” and “the extreme limits of the knowable world.” Like some of the essayists in the earlier section of Undiscover’d Country, Martin sees Sebald rejecting a totalizing view of history: “Science in the Enlightenment takes a totalizing character as a system for understanding the world under the banner of an unwavering belief in progress and rationality.” In After Nature and elsewhere, Sebald seems to completely reject this belief. Other posts relating to this volume are here. Last week I was in New York City and had the opportunity to see two-thirds of the exhibition After Nature at the new New Museum. (The exhibition is opening in stages and the installation of the second floor – the floor which “sets the tone for the exhibition”, according to curator Massimiliano Gioni – was not ready when I was there.) After enjoying the panoramic views of New York from the rooftop I took the stairs down and began the exhibition on the fourth floor. Stepping into a gallery, I immediately encountered a slim woman in jeans and shirt writhing in slow motion on the floor, long hair covering her face most of the time. Perhaps I was seeing the exhibition in reverse, I realized; but it was too late. The exhibition’s title, of course, is borrowed from W.G. 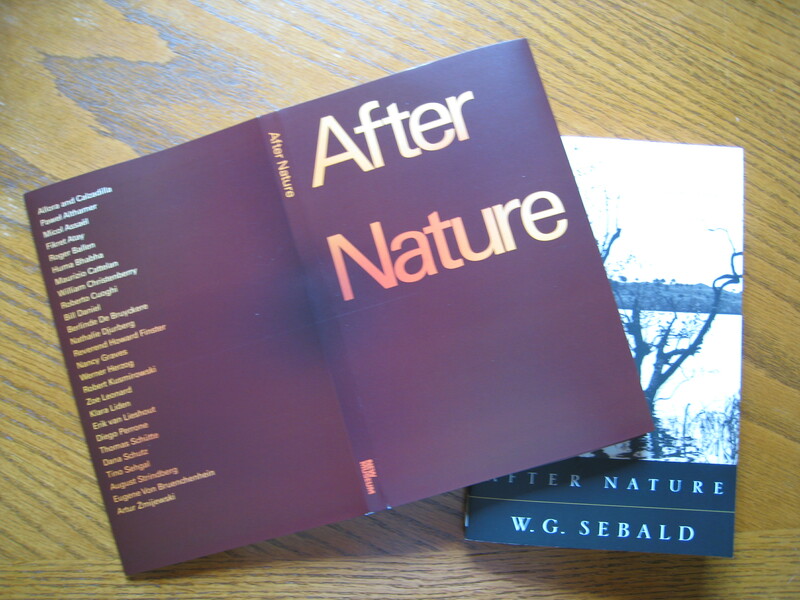 Sebald’s book-length poem After Nature. Gioni explains that his exhibition “aspires to a similar hallucinatory confusion [as Sebald’s writings], a conflation of temporalities, a blurring of facts and fictions – an exhibition as a visual novel or wunderkammer.” In addition to Sebald, the acknowledged guiding spirits are filmmaker Werner Herzog and novelist Cormac McCarthy. Rather than trying to define anything, After Nature seems to spiral outward in multiple directions: “offended sceneries and scorched earth”, “private cosmologies and universes untouched by man”, “ancient traditions and arcane faiths”, and the “bliss” or “madness” we might experience at the end of the world. There are already a number of exhibition reviews online already, some of which point out the exhibition’s lack of focus. 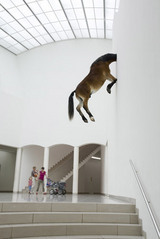 But whether that’s a problem or not (a characteristic like “focus” usually isn’t a goal for exhibitions at the New Museum), there are wonderful pieces to be seen, including Maurizio Cattelan’s untitled (2007) comic/apocalyptic horse implanted some twenty feet off the ground into a gallery wall and Robert Kusmirowski’s Unacabine (2008), a replica of “Unibomber” Theodore Kaczynski’s cabin. And then there was the writhing woman, who, it turns out, is one of several performers in Tino Sehgal’s piece Instead of allowing something to rise up to your face dancing bruce and dan and other things (2000). 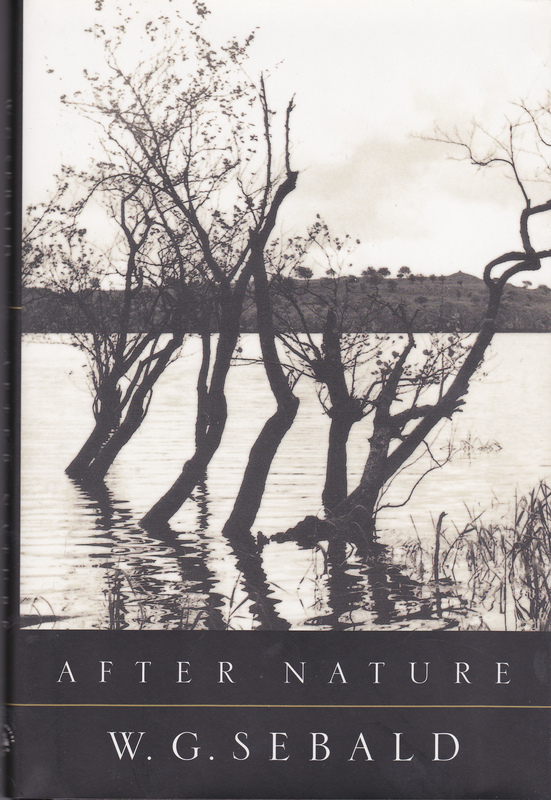 On the way out, I stopped and bought the eponymous shrink-wrapped exhibition catalog for After Nature ($24.95). Imagine my surprise when I discovered that it consisted of a dust wrapper that unfolded to six panels neatly tucked around a Modern Library paperback copy of W.G. 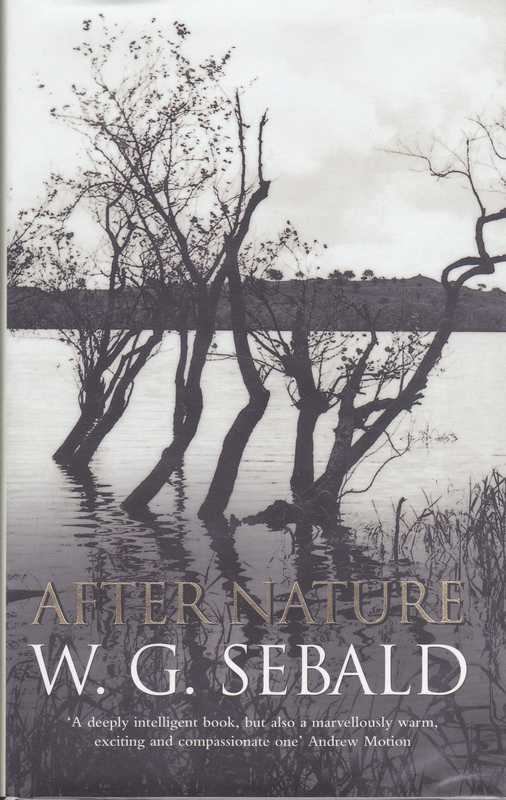 Sebald’s After Nature ($11.95). That’s a nifty mark-up for what is essentially a dust jacket. I don’t think I’ve ever seen an entire book appropriated like this before. The wrapper includes an essay by Gioni and a checklist noted as accurate “as of June 25, 2008”. Departing from the fictional documentaries of Werner Herzog and drawing its title from W.G. 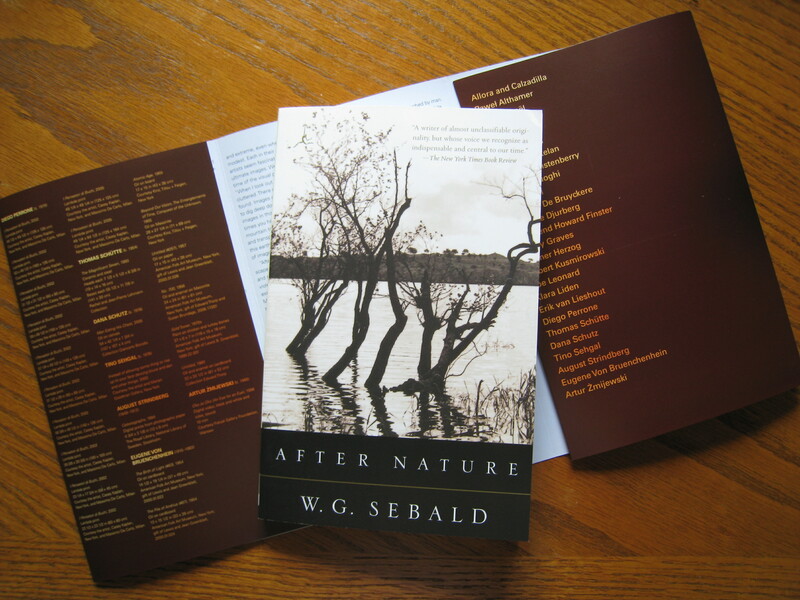 Sebald’s visionary book of the same name, “After Nature” unfolds as a visual novel, depicting a future landscape of wilderness and ruins. Bringing together an international and multigenerational group of contemporary artists, filmmakers, writers, and outsiders, many of whom are showing in an American museum for the first time, the exhibition is a feverish examination of humankind’s relationship to nature. Organized by Massimiliano Gioni, Director of Special Exhibitions, the show spans three floors and includes over ninety works. Part dystopian fantasy, part ethnographic museum of a lost civilization that eerily resembles our own, “After Nature” brings together artists and artworks that possess a strange, prophetic intensity. When seen in this context, Zoe Leonard’s giant sculpture of a crippled tree, Maurizio Cattelan’s fallen horse, Reverend Howard Finster’s delirious sermon cards, and Eugene Von Bruenchenhein’s apocalyptic finger paintings resonate like a requiem for a vanishing planet. Artists such as Fikret Atay, Roger Ballen, Robert Kusmirowski, Diego Perrone, and Artur Zmijewski seem fascinated by mystic apparitions, arcane rites, and spiritual illuminations, while Allora and Calzadilla, Nancy Graves, and William Christenberry depict a universe in which the traces of humans have been erased and new ecological systems struggle to find a precarious balance. The works of Huma Bhabha, Berlinde De Bruyckere, and Thomas Schütte share an archaic quality. Their magic realism transforms sculpture into myth-making and gives birth to a cast of fantastical creatures, including sylvan beings, totemic figures, and neo-primitive idols. These elements also find life in Tino Sehgal’s intricate choreographies: for the duration of the exhibition dancers carry out gestures that could be seen as mysterious rituals and states of ecstasy. Recuperating ancient techniques, Pawel Althamer uses grass and animal intestines to produce vulnerable sculptures and puppets to arrive at a new form of storytelling. Other works, like the animations of Nathalie Djurberg, the imaginary maps of Roberto Cuoghi, or the video travelogue of Erik van Lieshout, guide viewers to the edge of the earth, taking us for a walk in the fictional woods of our near future, while expressing a sincere preoccupation for the world as it is now. The exhibition will include work by Allora and Calzadilla, Pawel Althamer, Micol Assaël, Fikret Atay, Roger Ballen, Huma Bhabha, Maurizio Cattelan, William Christenberry, Roberto Cuoghi, Bill Daniel, Berlinde De Bruyckere, Nathalie Djurberg, Reverend Howard Finster, Nancy Graves, Werner Herzog, Robert Kusmirowski, Zoe Leonard, Klara Liden, Erik van Lieshout, Diego Perrone, Thomas Schütte, Dana Schutz, Tino Sehgal, August Strindberg, Eugene Von Bruenchenhein, and Artur Zmijewski. “After Nature” is made possible by the Leadership Council of the New Museum. Major support provided by David Teiger. Additional support provided by Kati Lovaas, Randy Slifka, and the Toby Devan Lewis Emerging Artists Exhibitions Fund. 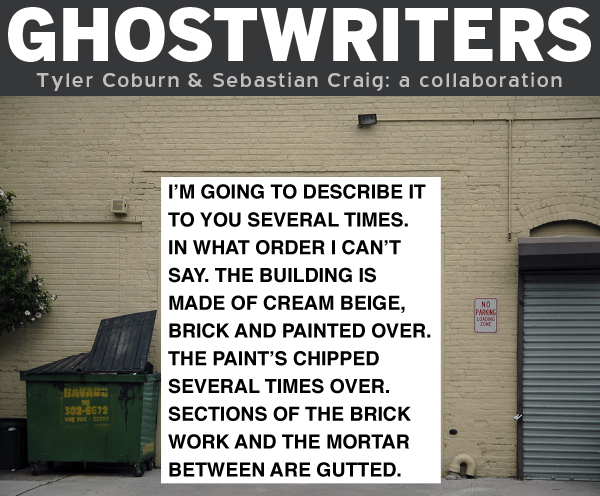 The first collaboration between New Yorker Tyler Coburn and Londoner Sebastian Craig, “Ghostwriters” is an imaginary account of Brooklyn narrated in drawing, architecture and prose. Building upon the work of Robert Smithson and W.G. Sebald, among others, Coburn and Craig will transform Jack the Pelican Presents into a sparse visitor center, populated with an evolving array of objects and interventions, including Craig’s projected 3D models of the gallery space; oversize, folded halftone prints of local buildings; and a binder filled with text documentation of improvisatory performances that Coburn staged, at Craig’s request, throughout the neighborhood. The collaboration is long overdue: Coburn first met Craig in London in 2006 at i-cabin, a project space and publisher Craig oversees. In i-cabin’s peripatetic activity and in Craig’s work, which has been exhibited at the Serpentine Gallery, London, and Tanya Bonakdar Gallery, New York, Coburn observed refreshing, innovative approaches to institutional critique. So after completing his first New York solo show, this past spring at MARCH Gallery, and rounding out screenings and exhibitions at CRG Gallery and Gavin Brown’s passerby, respectively, Coburn invited Craig to collaborate. As I read Aldalbert Stifter’s 1845 Christmas story Rock Crystal, which was published in 1999 as a petite volume by London’s Pushkin Press, it was easy to see why W.G. Sebald admired this nineteenth-century writer so much. Rock Crystal contains the bits and pieces required to construct a morality piece, but in the end Nature shoves everything aside with all of the rudeness of an avalanche. South of the village you see a snowy mountain with dazzling horn-shaped peaks. A shoemaker from one village successfully woos the daughter of a wealthy dyer from a village on the other side of the mountain. But more than a mountain separates the two villages. The dyer’s daughter has broken tradition by crossing over to the other village, and her father responds by withholding most of the dowry. Within a few years, the shoemaker and his wife have two young children who regularly trek across the mountain to spend a few hours with their grandparents before returning home. Mothers may love their children and tenderly long for them when they are absent, but a grandmother’s love for her grandchildren amounts almost to a morbid craving. One year on the day before Christmas, after a dry and warm autumn, the two children cross over the mountain for a holiday meal with the grandparents. They are dutifully warned about the dangers of winter storms by their father before the depart and they receive the same ominous warning from the grandparents as they set out on the return trip. Naturally, halfway home, a furious snowstorm suddenly begins. But on every side there was nothing but a blinding whiteness, white everywhere that none the less drew its ever narrow circle about them, paling beyond into fog that came down in waves, devouring and shrouding everything till there was nothing but the voracious snow. The two children are soon hopelessly lost in an environment that becomes less and less real and more and more dangerous. As far as the eye could reach there was only ice. Pointed masses and irregular clumps thrusting up from the fearsome snow-encrusted ice. Instead of a barricade that could be surmounted, with snow beyond, as they had expected, yet other walls of ice rose from the buttress, cracked and fissured, with innumerable meandering blue veins, and beyond these walls, others like them; and beyond, others, until the falling snow blurred the distance in its veil of gray. At night they take shelter beneath to massive boulders and struggle to stay awake and alive. The blinding storm abates and reveals its opposite – the infinite universe of the sky. The following day the two children are found, rescue parties from both villages having set out in a symbolic breaking with the past. Stifter makes token mention of the improved relations between the villages, but the last word, as it were, goes to the mountain. The children, however, can never forget the mountain, and earnestly fix their gaze upon it when in the garden, when as in times past the sun is out bright and warm, the lime tree diffuses its fragrance, the bees are humming, and the mountain looks down upon them as serene and blue as the sky above. The sublime beauty and terror of snow, ice, alpine heights, and northern extremes is a thread that runs through Sebald’s book-length poem After Nature. In the first section, devoted to the sixteenth-century German painter Matthias Grünewald, we see “the ice age, the glaringly white / towering of the summits…” in the background of Grünewald’s Temptation of Saint Anthony. At the end of this section, Sebald imagines Grünewald staring at the landscape, mourning the death of his teen-aged son. a colourless image of the Earth. the snow on the Alps. In the second section of After Nature, Sebald writes of the voyage of exploration of Vitus Bering, who pursued the “vast tracts of whiteness” of the Arctic Ocean between Siberia and Alaska. And in the final, autobiographical section, Sebald recounts how, at the hour he was born, a freak mountain storm killed four canopy bearers who were helping with the blessing of the fields on Ascension Day. For more reading along these lines, try Mary Shelley’s Frankenstein (1818), possibly the ultimate novel of the Alps and the Arctic, and Peter Davidson’s wide-ranging study The Idea of North (London: Reaktion Books, 2005). The cover illustration for Rock Crystal, by the way, is from a painting by the British artist Jason Martin. W.G. Sebald’s books present a number of challenges to book designers, not the least of which is the inclusion of images (some of them deliberately of very poor quality) within his texts. And then there is the challenge to the book jacket designer, who must cope with the fact that there is no identifiable topic to Sebald’s prose and poetic texts. Typographer, author, critic, and editor Robin Kinross addresses these issues in a wonderful essay in his book Unjustified Texts (London: Hyphen Press, 2002). 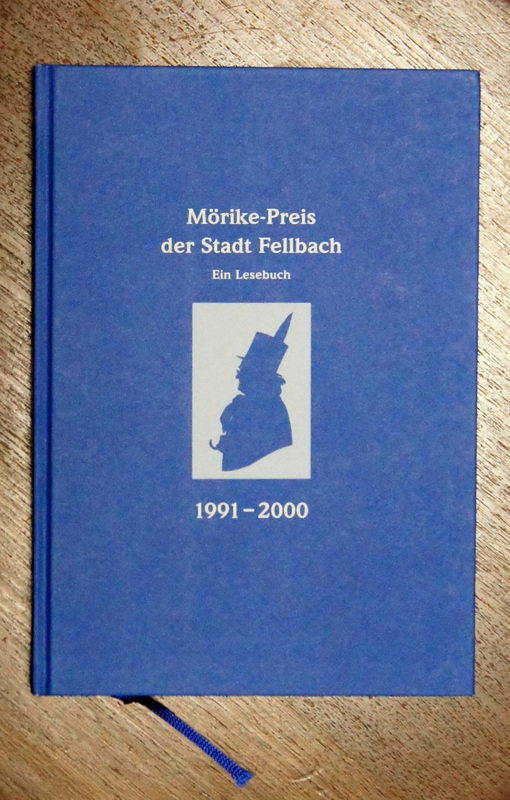 His essay, Judging a Book by its Material Embodiment: A German-English Example (pp. 186-199) opens with some reflections by Theodor Adorno on the commodification (i.e. consumerification) of books in the twentieth century, then proceeds to a brief history of Die Andere Bibliothek, the important series of books edited by Hans Magnus Enzensberger. 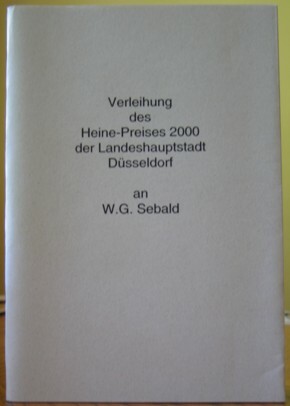 Sebald’s first three prose works were released as volumes in this series.Founded in 1985 as an idealistic collaboration between the editor Enzensberger and the publisher Franz Greno (who published Sebald’s most exquisite book Nach der Natur in 1988), the series was sold to Eichborn Verlag in 1989, although Greno continued to be in charge of book production. The Andere Bibliothek was, and still is, an attempt to publish books of real content in a form that had distinct material quality, and which, in sum, resisted the apparently irresistible processes of commodification. tells us something about present-day literary culture in the two countries [and] something about Sebald’s enterprise as a writer. Anyone interested in books and book production will enjoy the entirety of Kinross’ book. On topics ranging from Jan Tschichold to the layout of the Dutch telephone directory, Kinross brings an erudite intelligence, a sharp eye, and high standards to the discussion. 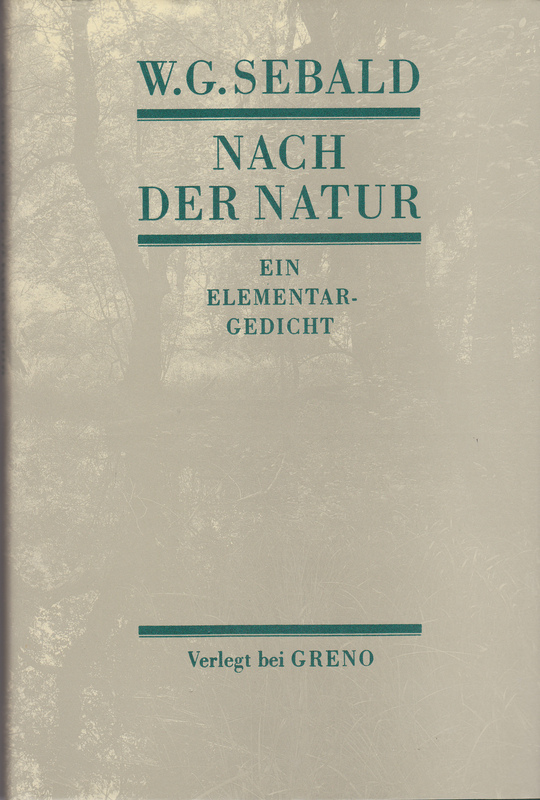 In English, the volume was called simply After Nature, without the subtitle Ein Elementargedicht, which literally translates as “an elementary poem”. The English language volumes also lack the four double-page photographs by German photographer Thomas Becker, which form a prelude and coda to the volume’s text matter. The American edition by Random House (below) curiously omits the admittedly brief Contents page (there are only three poems), but feels the need to tack on three pages at the end for About the Author, About the Translator, and About the Type. Clearly, Sebald (or translator Michael Hamburger) was struggling with Sebald’s reference to the obscure 18th century newspaper the Intelligenzblatter and toyed with the possibility of suggesting that news items read by Steller were “docketed” or “inserted” into a generic “journal”. In the end, simplicity and clarity won out and it was decided to refer to “news items”, dropping any reference at all to the existence of a newspaper, specific or otherwise. 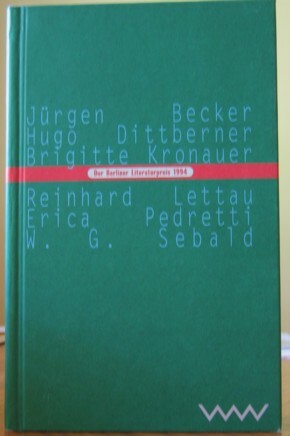 The original German publication by Greno is a stunningly beautiful slim volume bound in deep green cloth, with finely printed photographic endpapers of Becker’s photographs. The British first edition, although in unfortunate dull brown boards, feels better designed and more generous that the Random House first edition. It employs the typeface Monotype Perpetua and a larger font size, which provides elegant, bold Roman numerals for the frequent section headings of the three poems. The British version’s thicker, whiter paper gives the poems more gravitas, leaving the American version feeling thin and overly delicate.